I screwed up my [d] wave calculation. 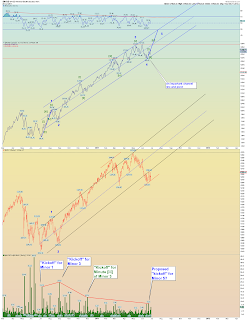 I had it at 1327 but rechecking my Fib math I should have had 1333 SPX as being [d] = .618 x length of wave [b]. After wave [d] I expect a perhaps nasty [e] wave that pulls back to at least to 1303 in a zigzag move possibly all the way back toward 1295. We shall see. Important point is that it likely will be swift and catch a lot of new bulls off-guard. Still holding out that the dollar may be in a giant ED pattern. The Wilshire violated its proposed wave [i] price low. So we'll track the Minor 4 triangle count as the primary count. 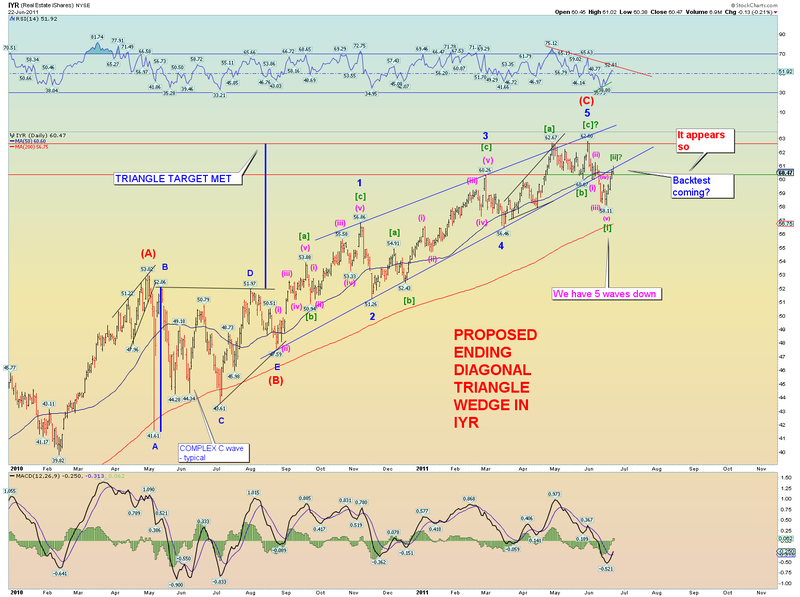 SPX has a target of 1327 for [d] wave peak using the triangle count. The squiggles may align well with that. And here is the complete P count based on (C) = (A) in time. NYAD stretching its legs in a possible Minute [iii] of Minor 5 count. 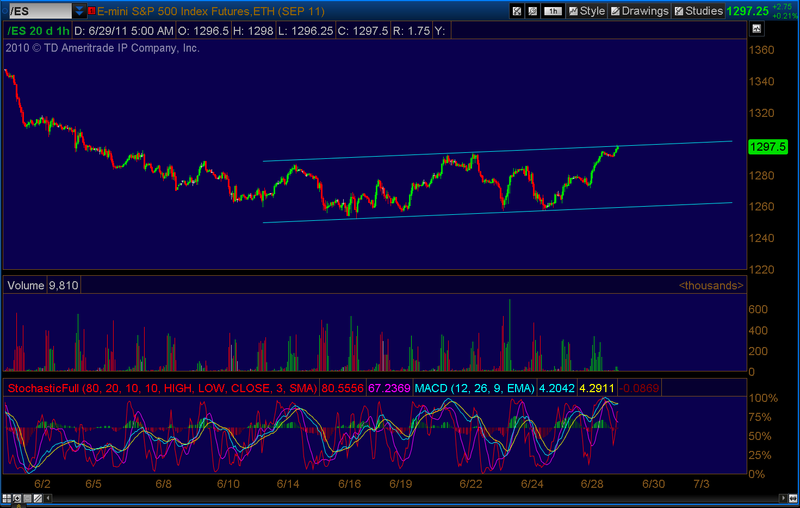 Until it can break higher out of this channel, it still can be viewed as counter-trend. [Update 6:53PM: I don't ever recall having a count on Silver, but here is my chart I've had on my public page for a while. 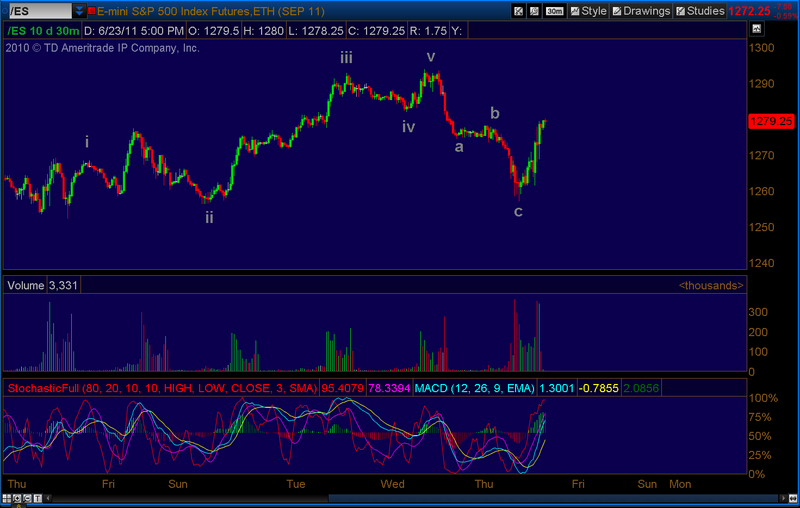 The key to this count is the Blue 4 pivot low, prices need to stay above that. [Update 6:36PM: NYAD shows 6 touch points on the up channel. 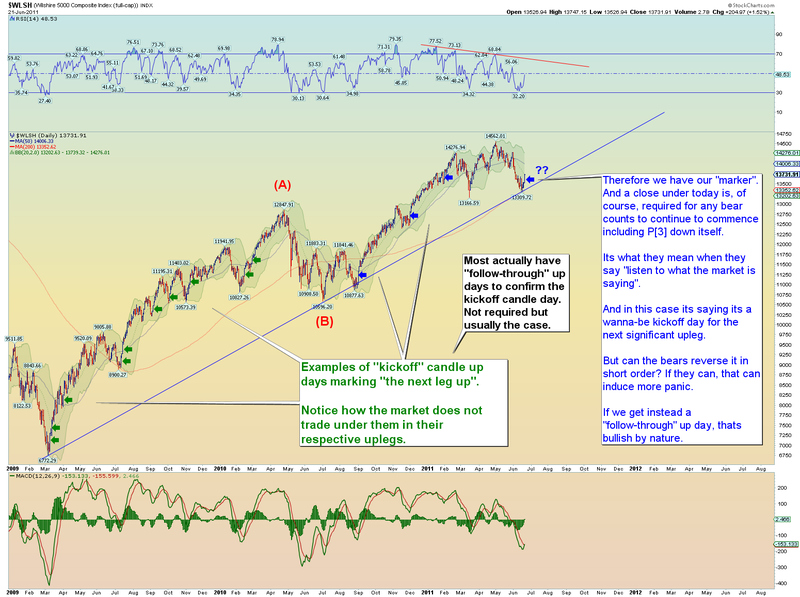 The Wilshire 5000 closed above its previous pivot which is a bullish development. Market internals were stronger than yesterday's which suggests the market is strengthening for a possible breakout above 1300 SPX again this week. 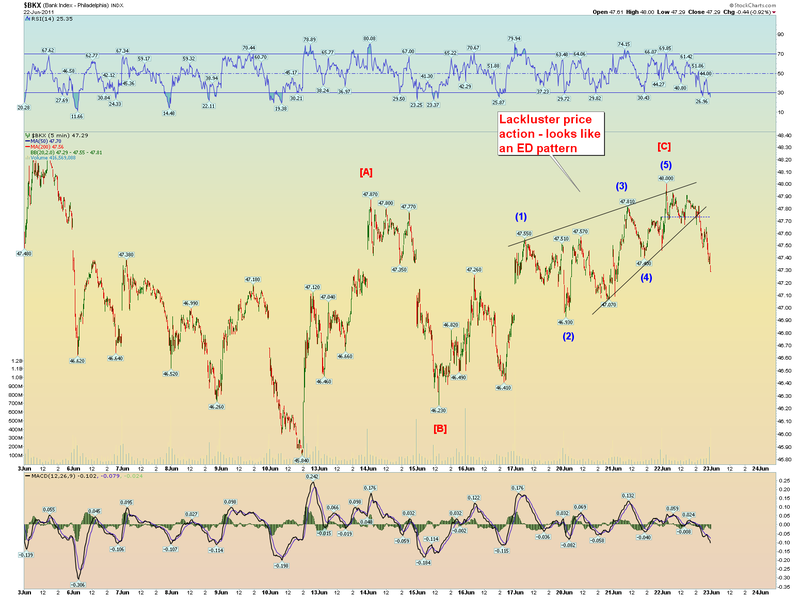 If the SPX is tracing a bullish Minor 4 triangle, its [d] wave target is 1326-1328 SPX. Time cycles are a guess. Top bear count still has a chance. 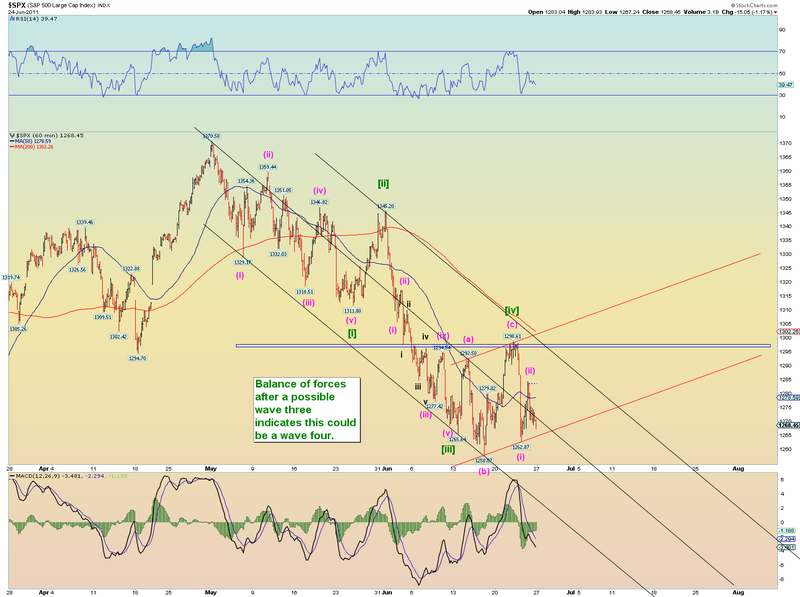 However, the market needs to reverse down yet again in a hard move. 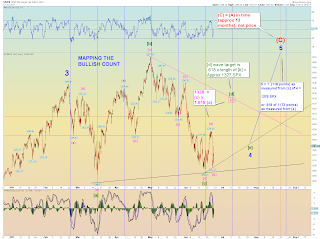 A price move above 1311.8 SPX would eliminate the count. [Update 7:51PM: Updated 6 month yield chart. 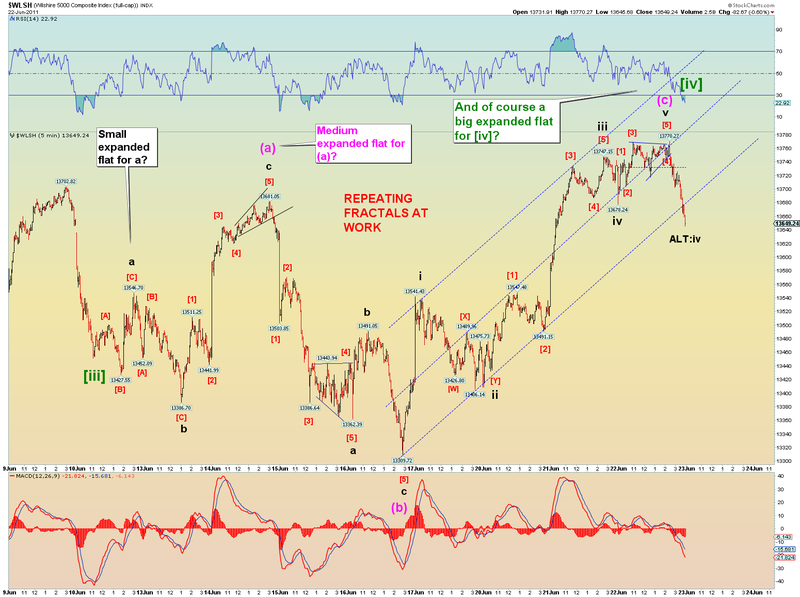 They can't get much lower folks and we may have a completed EW long term pattern. Who would have thought yields would be rock bottom on the verge of Congress wrangling over a debt ceiling raise over the current $14.2T? Yet thats where we are. However, its about a perfect bearish setup for the long-term outlook on things. Massive debt loads being serviced at historic low rates. And its now a Ponzi trap and it has clamped shut. We are not "traveling down a road...", we have already traveled it and have come to near its end. We find there are no unicorns at the end of the rainbow. Only a bad social mood and a desire to shed oneself of debts. That individual desire to get out from under the debt bomb is slowly translating into government action which is, as Prechter always points out, the ultimate consensus group which takes time to change directions. But changing it is. The Federal Reserve, although we like to think of it as a one man band, is also a consensus group and they too are subject to the laws of social mood. They also are showing an unwillingness to leverage up any further than they already are. The sovereign debt games have only just begun. Again, nothing has notably changed than from what we have been talking about for the last many sessions. 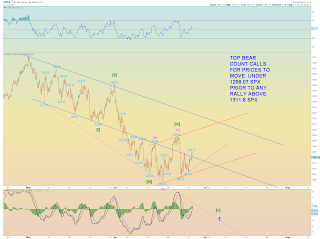 The top bear count calls for a break in prices under 1258 SPX prior to any rally above 1311.8 SPX. 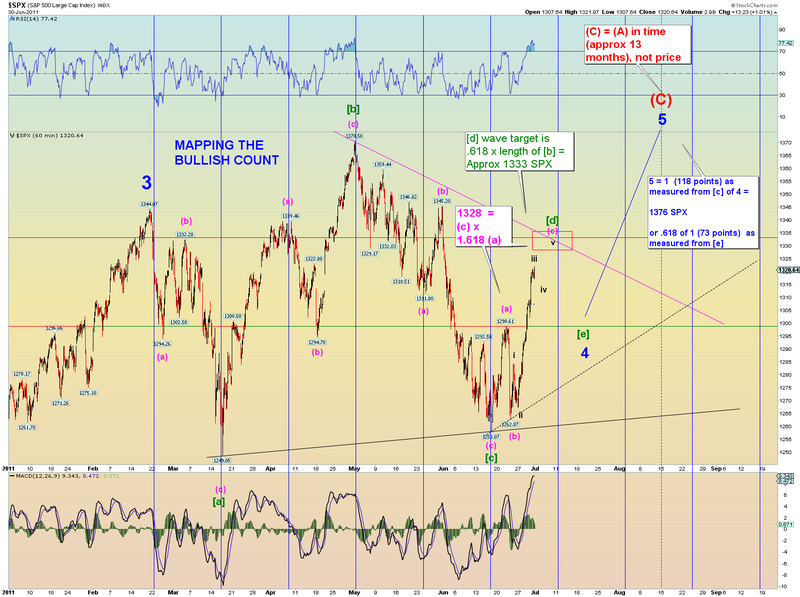 That supposes the current bull/bear struggle is a sideways Minute wave [iv] of Minor 1. 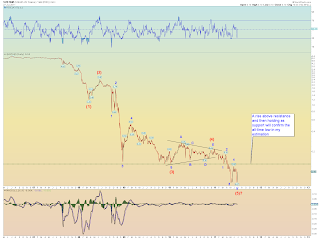 Minute [v] of Minor 1 can turn out to be a spike down panic wave (or not - it need only make a new price low under 1258). So we have potential for a serious round of selling which would be fitting in that both the uptrend line from the 2009 lows and the 200 DMA will have to be broken under both in order to take out the 1258 SPX Minute [iii] low. 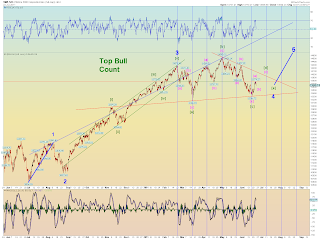 The top bull count supposes price will maintain and that the market is working on a long Minor 4 running-type contracting (or descending if it turns out to be) triangle that will eventually hold support and make a challenge to the old highs. 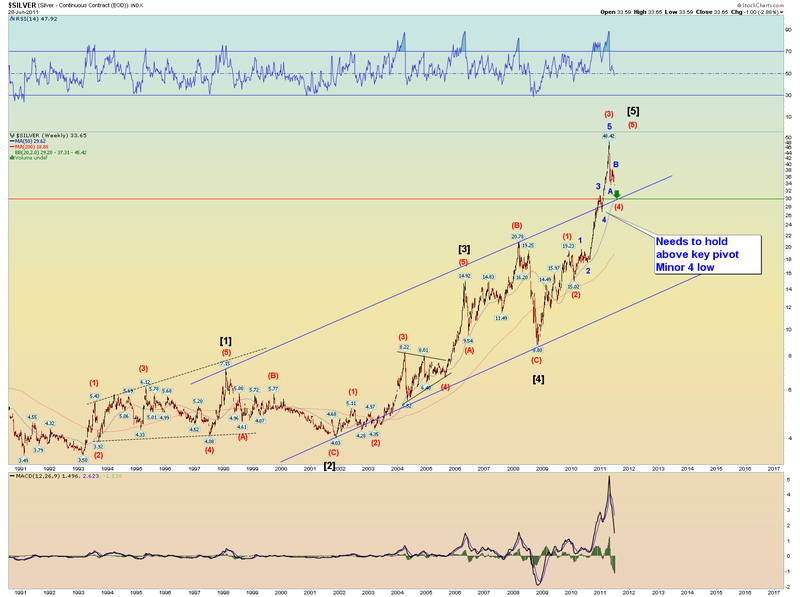 My 30 year bond yield chart still calls for a yield low to challenge my "blue box" area. 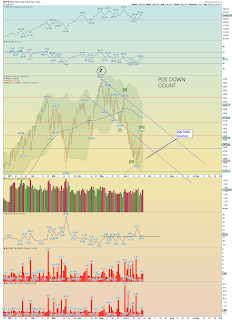 If we have a panic "flight to safety" coming up in equities this would nicely fit into the bond count picture. 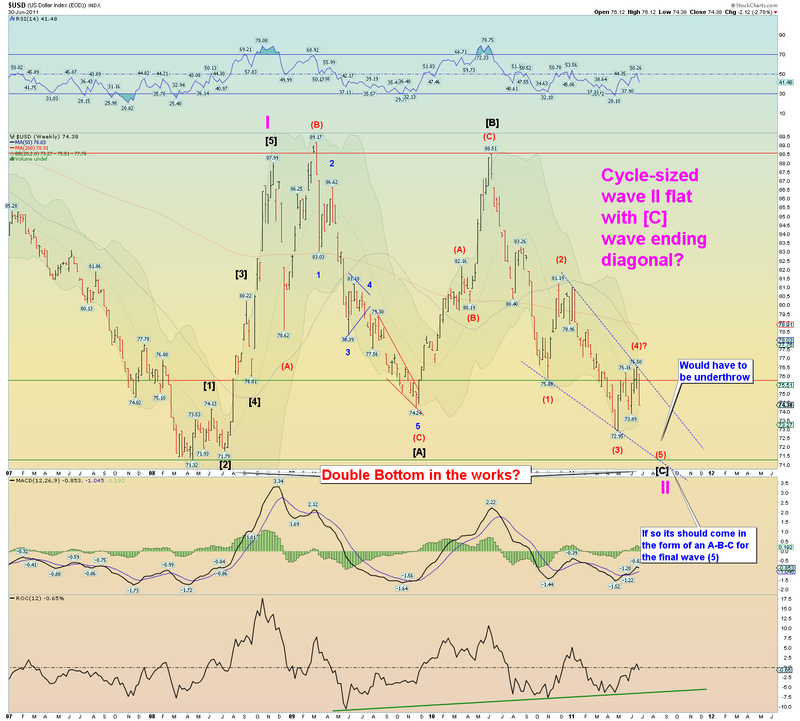 A glut of treasury issuance could wind up sparking a wave (3) UP in bond yields after my wave (2) lows are set. And I think would pull up short term debt yield and perhaps catch the FED off guard and a possible spike in the 3 and 6 month yields sparking rumblings of short-term interest rate hikes. 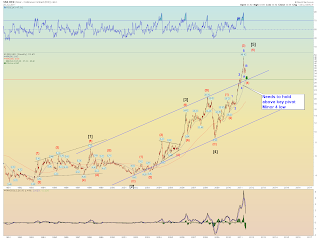 Is a rise in interest rates bullish long term? Umm, no. The greatest credit bubble in the history of mankind can no longer afford a rise in interest rates at all. Its simple math. I don't need to go into all the reasons why even a few percent will kill the "recovery". First off think of credit card debt, home loans and other loans being more expensive - well you get the idea. The final act to kill the consumer and piss him off for good in social mood. 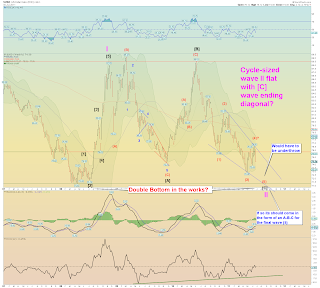 RISING YIELD DEFLATION. Yes thats not in any textbook and not "supposed" to happen, but thats the way I see it. Not much to add to what we have been saying last few days. 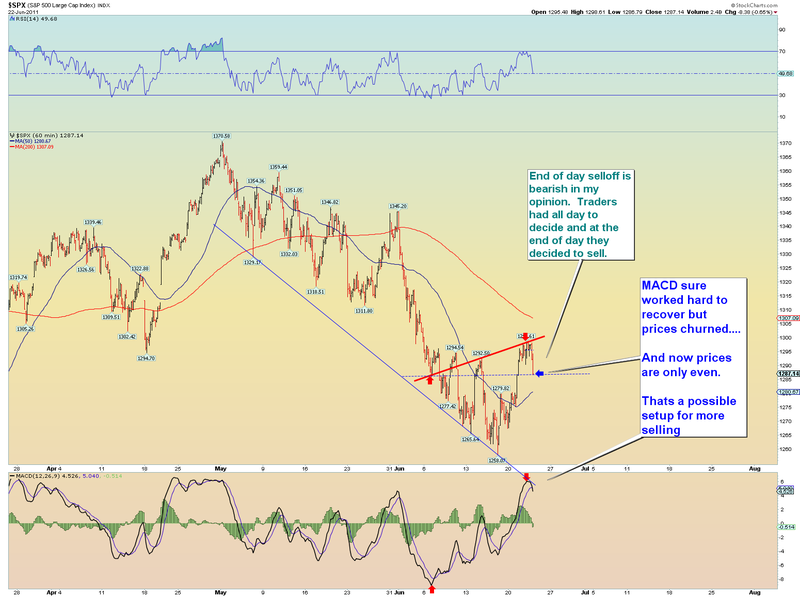 Today was uninspiring price action and can only be viewed as bearish near term. 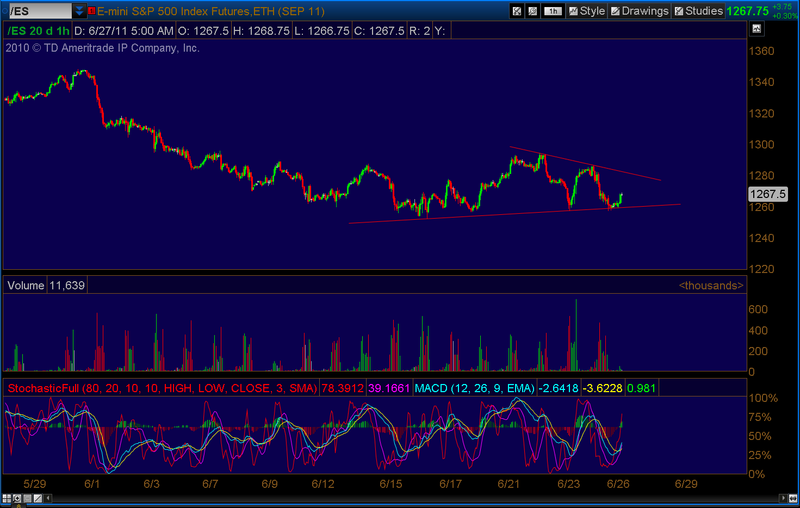 There is no interest yet in pushing this market above 1295-1300 resistance. 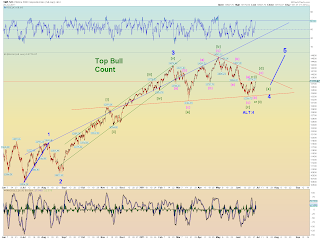 Yet there is some buying interest as there has been a sort of stalemate between bearish and bullish forces for a few weeks. 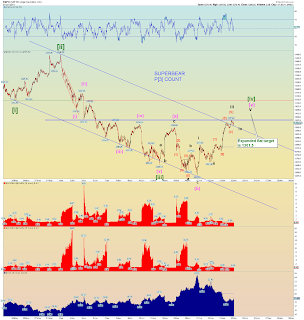 I think that best fits into a Minute [iv] sideways wave count. 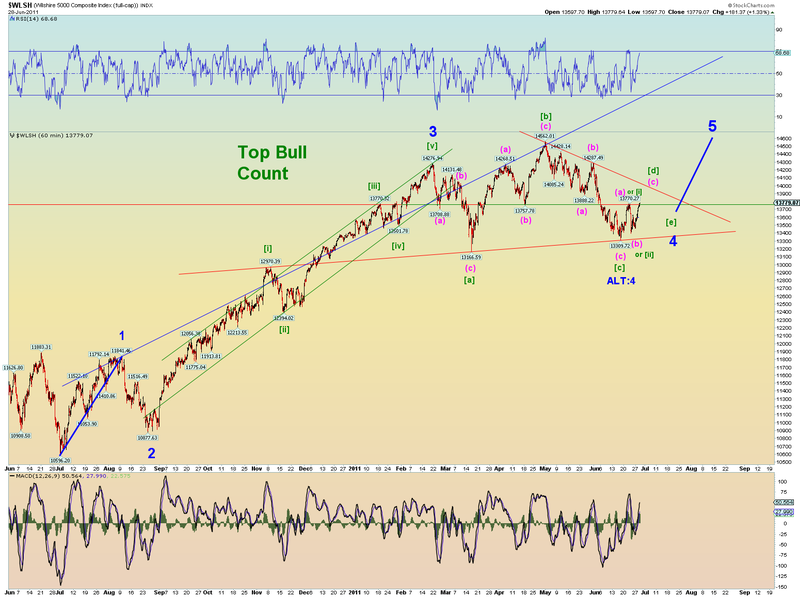 I would say the EW squiggle count favors a 5 wave down count (at the least) that has not yet finished. In other words, we didn't have to get creative in making this count. And here is the local interaction. 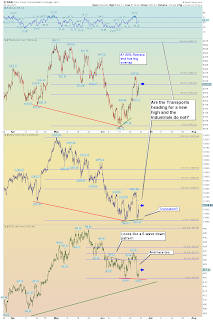 Is there one more lurch for the Industrials back to the underside of this line and while doing so diverge with the Transports producing a local divergence along with a gargantuan 3 year divergence? Curious, we'll keep an eye on things. [Update 6:51PM: Dow Theory local divergence non-confirmation watch. 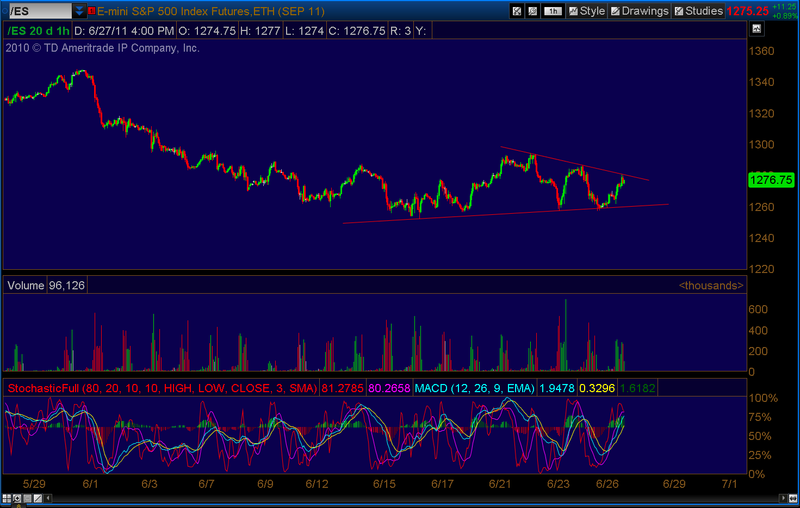 Its already diverging at this rate. This seems like a great opportunity to catch some cheap puts at the right moment and perhaps catch a huge downward quick move if this is exhausting which I think it is. 1. 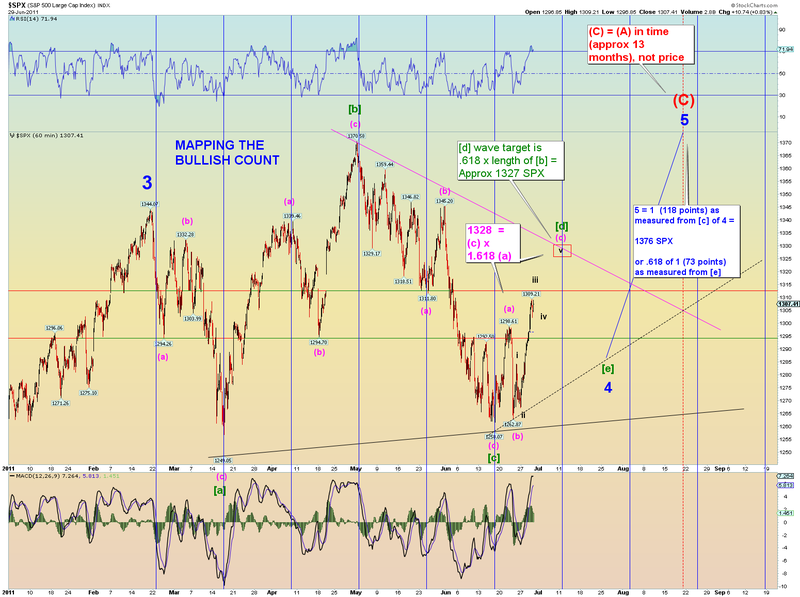 We have 3 waves into the 1370 SPX high - Neutral to Bullish weighting. It would be better to finish with a "five" into a high. 4. 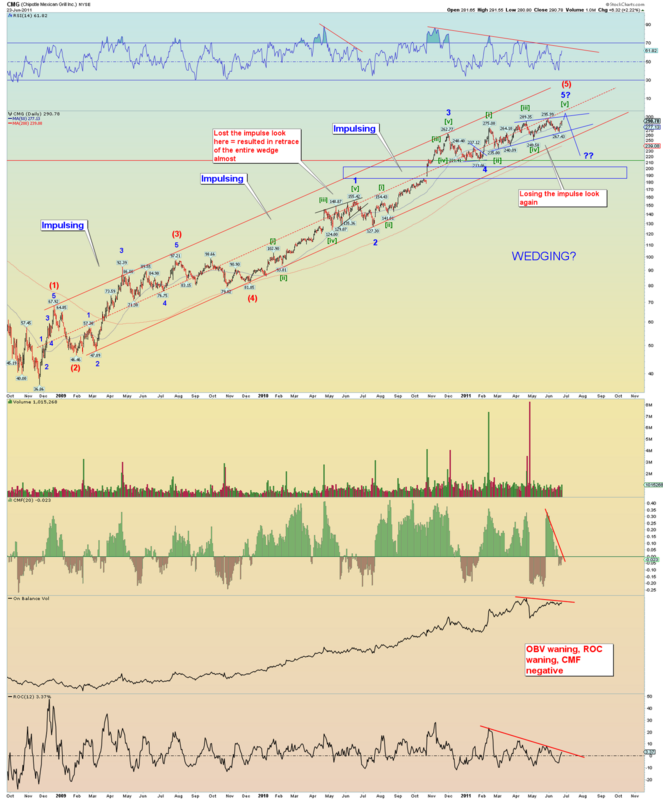 Intermediate wave (C) does not currently relate to Intermediate wave (A) neither in price nor time. If the market topped in August, (C) would match (A) in a Fibonacci 13 months time. = Neutral. 5. Wilshire again closed within the bear down base channel. Bullish. 6. The only blue box virgin wave space (marking "third of a third") has already been closed intraday = Bullish. 1. 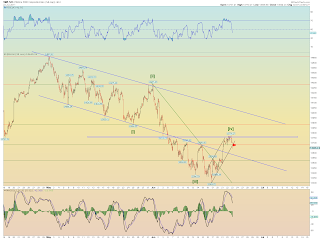 We have what appears to be a bottoming process over the last 2 weeks +. 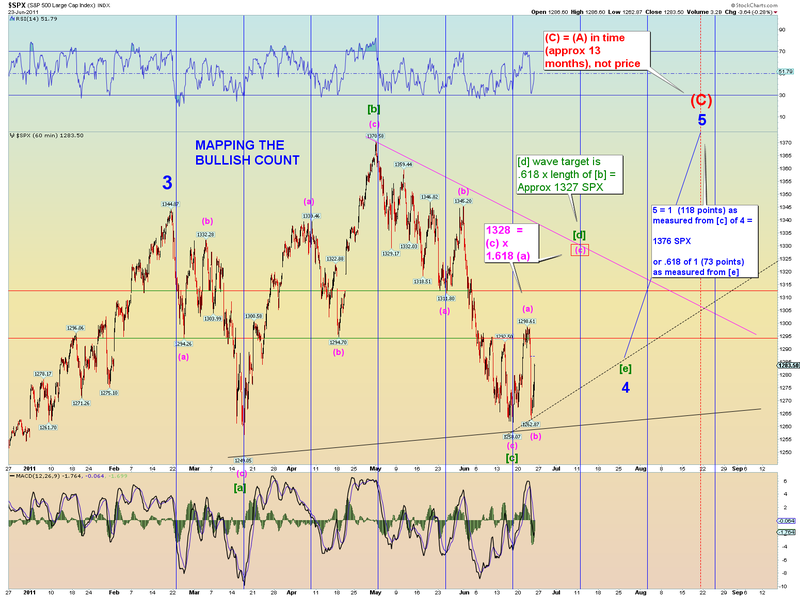 Seller may be diminishing = Bullish near term. 2. 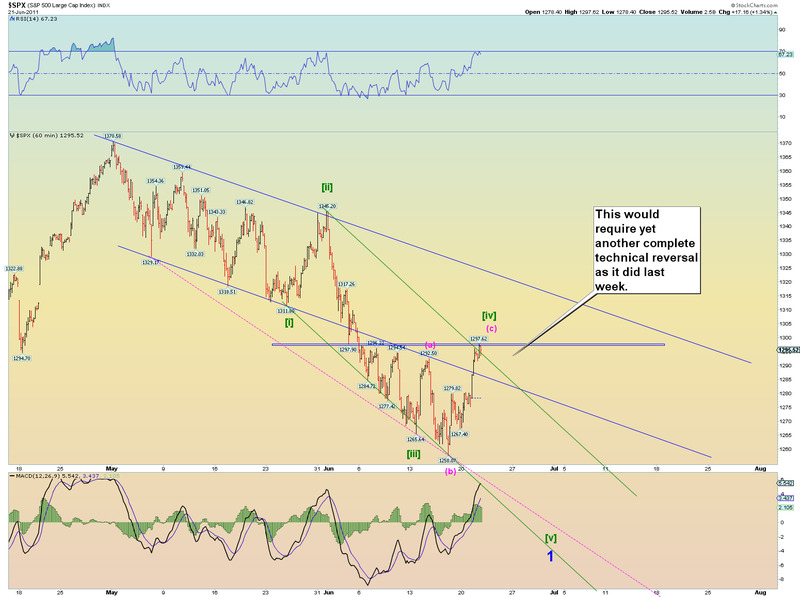 We have a "higher high" breaking the downtrend in conjunction now with a "higher low". 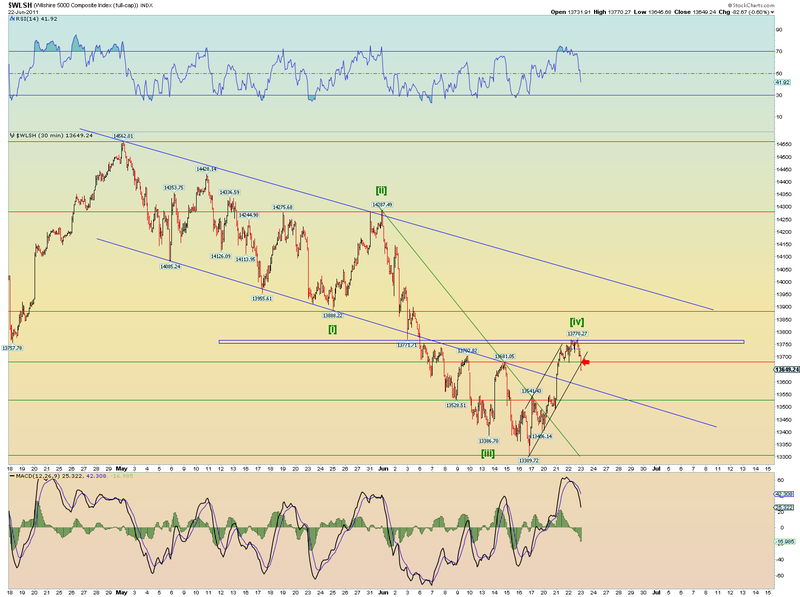 = Bullish near term. 3. We had one more bout of selling after the higher high but intra-day price action was very bullish and closed on buying = Bullish near term. 4. Bears had a chance to reverse Tuesday's "kickoff" day and in fact traded under it today but the market did not close under it. = Neutral weighting. 5. 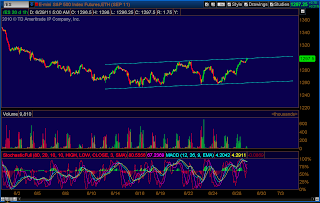 NASDAQ had a intraday-non confirmation early today signalling today's spirited rally. = Bullish near term. 6. 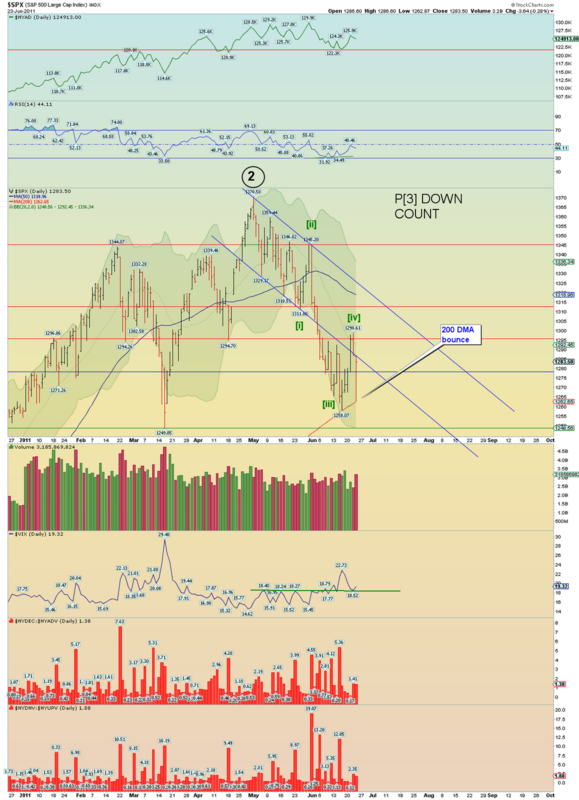 No index made lower lows.= Neutral. 7. 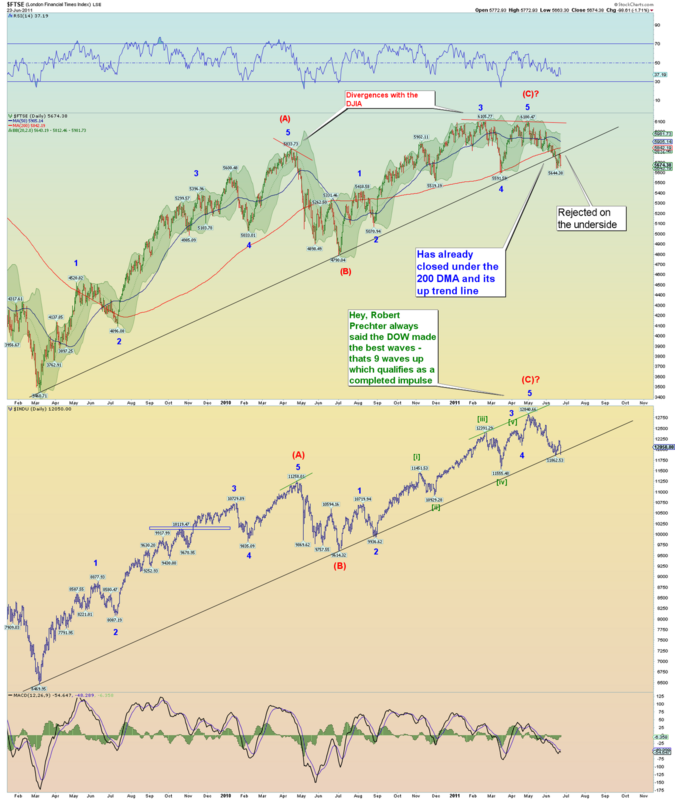 We have had 2 solid tests of the 200 DMA and both responded with bullish price action = Net neutral. 8. 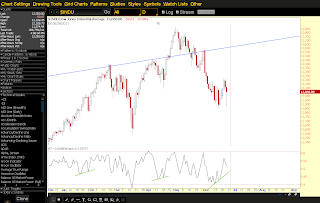 Market has obeyed and bounced off the uptrend line from the 2009 lows. = Net Neutral. 9. Market had a high-volume hammer candle today. 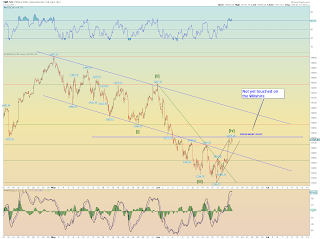 = Bullish potential - but could be churn. 1. We have many Intermediate term sentiment indicators and surveys near or at bearish extremes yet all the bears have accomplished over 2 months is to get the market back to its 200 DMA in a 3 wave move. 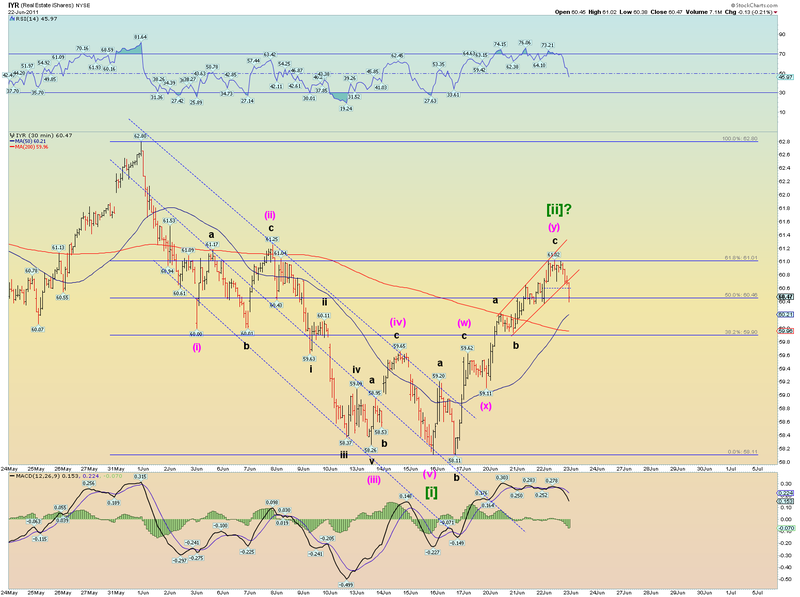 = Bullish Intermediate Term....but from what price low and wave count? 1. We have signs of decreased selling over the past 2 weeks and now that is in conjunction with a higher high and higher low. = Bullish near term. 2. VIX is not recording any real panic = Neutral. Depends on how you look at things. 3. 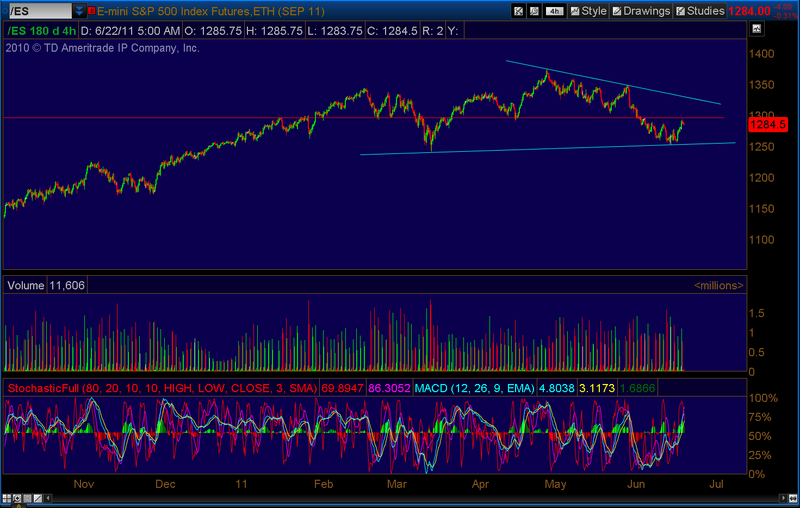 Volume has not been terribly heavy for 2 months = Neutral to bullish. 4. 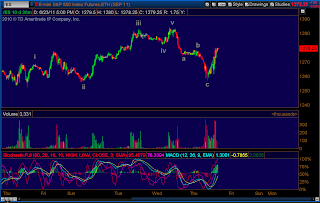 NYAD count supports a move higher. Also NYAD in accumulative mode generally has not declined much to speak of since the high. 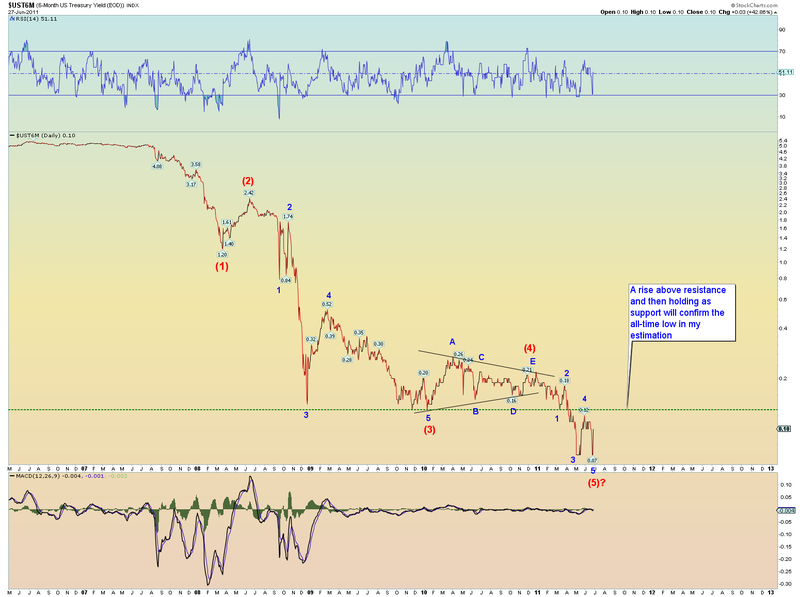 Still a lot of accumulating going on = net bullish. 1. 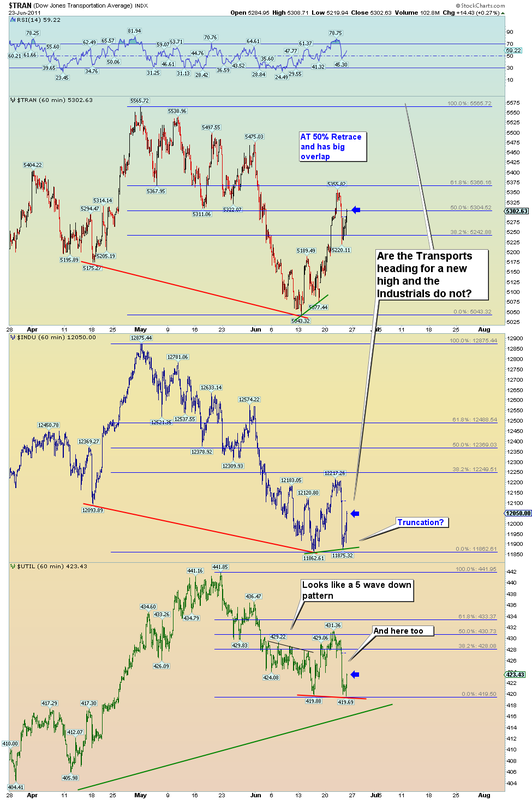 We have no localized DOW theory non-confirmation. We have a long term non-confirmation, http://1.bp.blogspot.com/-YJ01VMTmC_U/TeaplXY8PNI/AAAAAAAAJPw/lJ_IF8QpXIg/s1600/trans.png but the theory would be better if we had a more localized non-confirmation divergence. Not required. 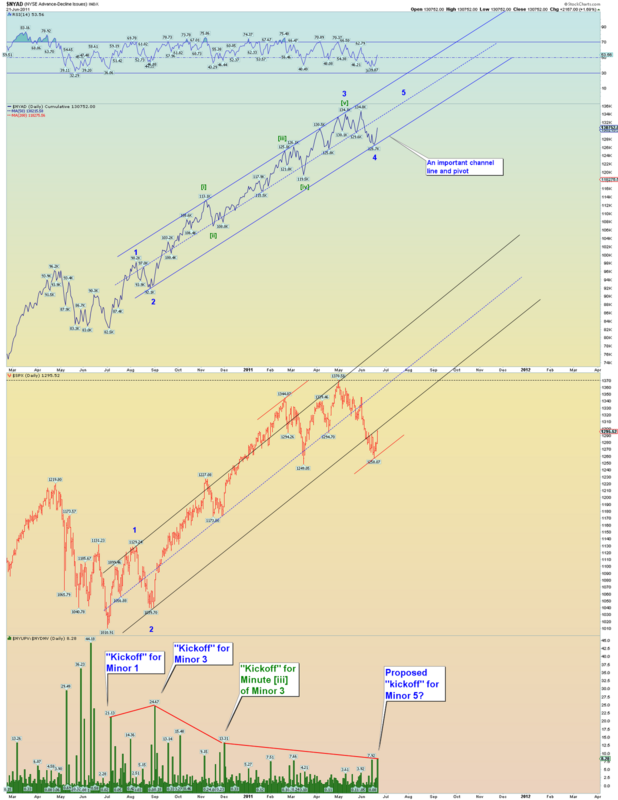 Although price action, long-term sentiment and near term wave action all potentially support the Intermediate term bullish case of possibly challenging the 1370 highs sometime in the next few months, credit stresses need to be taken seriously. It is a sign of an underlying deteriorating market in danger of a liquidity lockup (and hence flash crash maybe even). 2. Resistance levels. Even though the bulls have maintained above the 200 DMA, they haven't re-conquered the "brekadown" resistance of 1300 area. 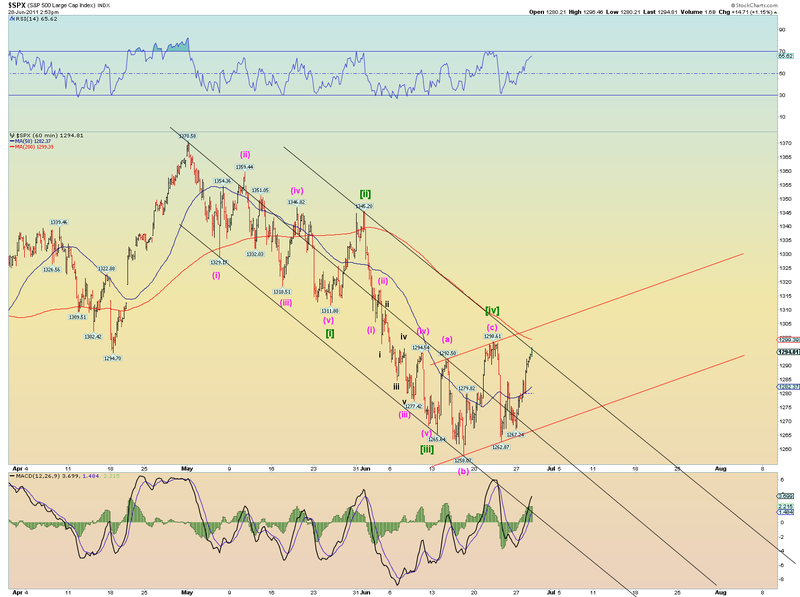 And they have further resistances above that. 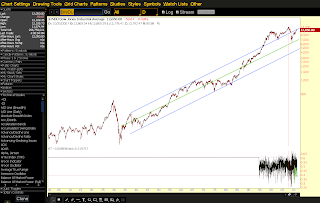 Any rally can be looked upon to possibly open the floodgates of stock supply. So even though price action can be viewed in a positive manner the past few weeks, the bulls haven't accomplished a whole lot for their efforts. One could say all they have done is stave off DOOM for a few days at best. 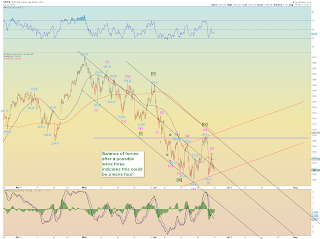 Should we get a lower low under 1258 SPX prior to breaking our proposed Minute [i] low of 1311 SPX, we have 5 waves down. 5 waves down is required to confirm a trend change and in my opinion we have not yet had that happen. 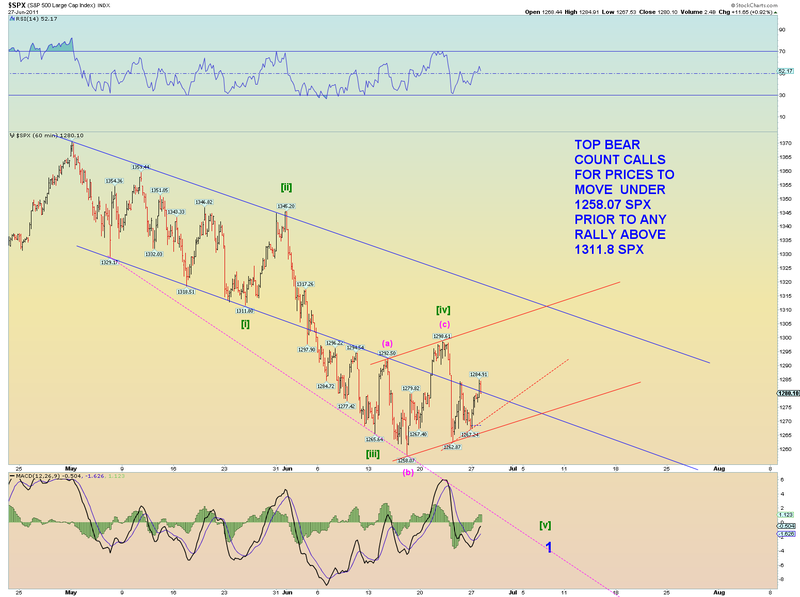 The bears need a lower low prior to 1311 being violated. Its that simple and it can be done. 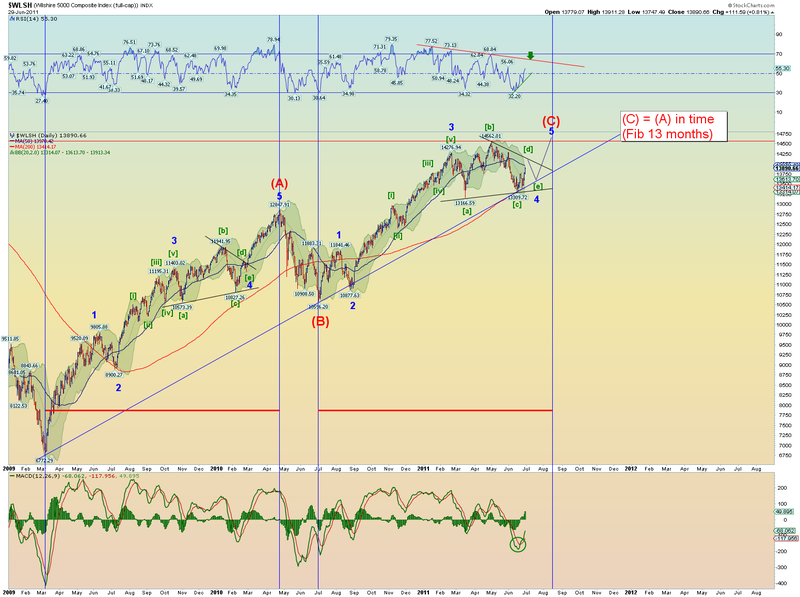 Arguably 5 waves up, but definitely counts well as only 3 waves down = Bullish near term. 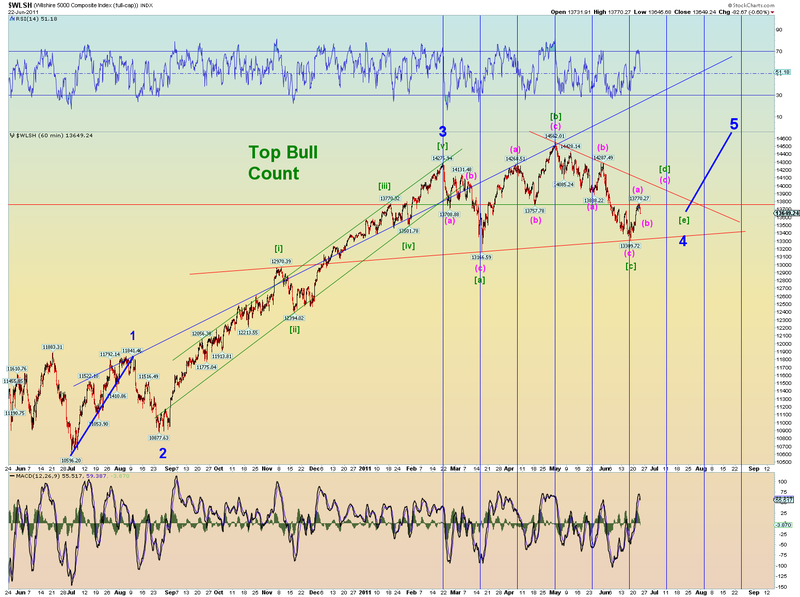 There has been a net balance of bear and bull forces over the past few weeks. 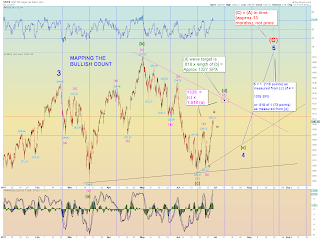 This can generally be viewed as a Minute [iv] corrective wave period. 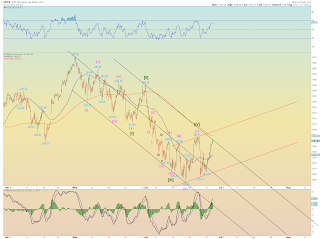 All we need is a lower low to confirm under 1258 SPX. Despite this, the bulls have shown vigorous spirit. Its as if they know another low under the 200 DMA spells long-term doom and a potential trend change. 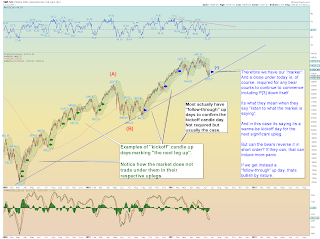 Not to mention there is likely a gold mine of stops, mental and otherwise, residing under the up trendline and the 1250 SPX mark. A cascade downward may be induced if prices can get there. It is being heavily defended. It comes down to who can win the next "follow-through" day. 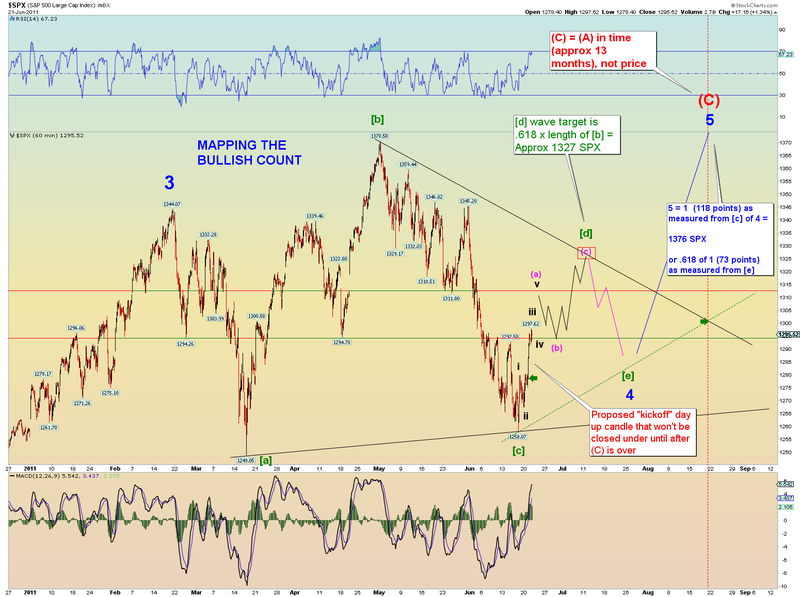 If the bulls can squeeze toward 1311, they can wrestle control back in the Intermediate term perhaps. If the bears get a lower low under 1258 SPX, they have a 5 wave pattern down and arguably a trend change. [Update 8:05 PM: Update on BKX. 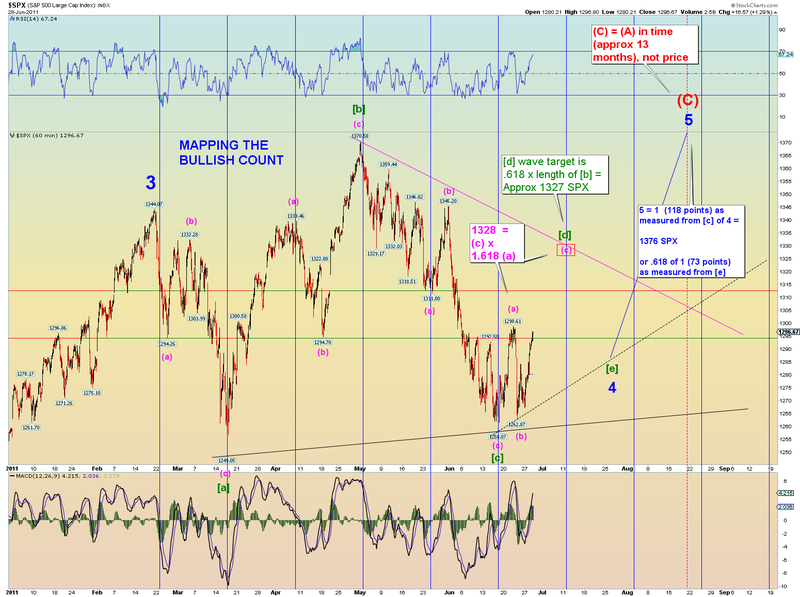 [Update 7:45PM: One reason to still be bearish is that there was no "clean count" to the recent 1258 SPX low. The waves work best if counted in conjunction with what I have below perhaps. It may turn out to be bunk, but it was sure fun to count and label. [Update 6:40PM: IYR chart update. 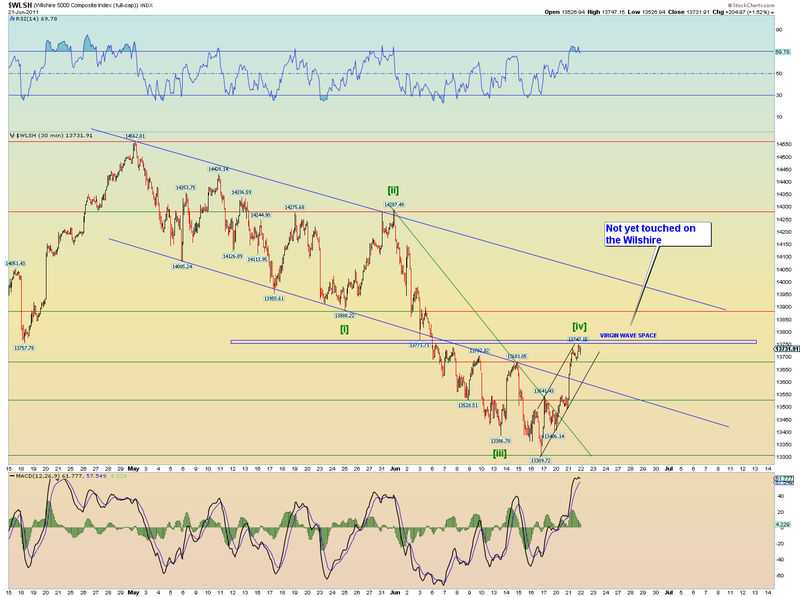 Possible impulse down and 62% Fib correction and backtest. [Update 6:15PM: Via the always fantastic Sentiment Trader, http://www.sentimentrader.com here is the "Smart Money" index I talked about earlier. Sentiment Trader pointed out the non-confirmation the other day in their morning report and since then it is still diverging. "Smart Money" supposes the first half hour is emotion-based trading (i.e - "Dumb" money) and the last half hour of trading is the opposite. So in past declines we can see Smart Money was buying at end of day. 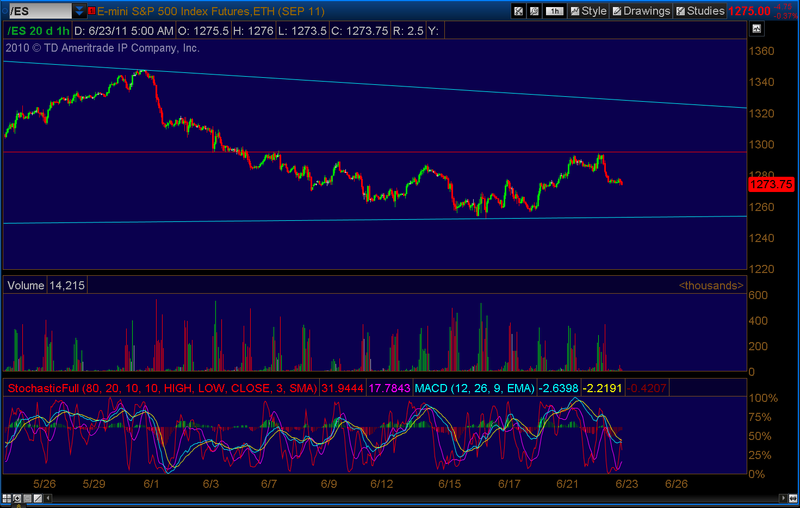 This decline from 1370 has seen the opposite behavior with today no different. The theory is that when Smart Money finally again shows buying interest (presumably at lower prices levels) then we would expect a significant bounce higher than we have. For now the SMI indicates further declines are coming. 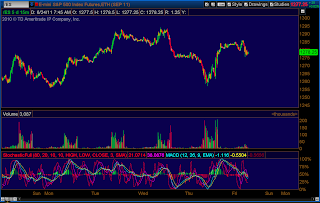 This chart reflects today's trading by the way. 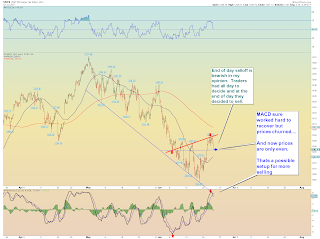 [Update 6PM: Again looking at the hourly chart, the MACD signal lines fully recovered and then some. Yet prices for the most part churned. 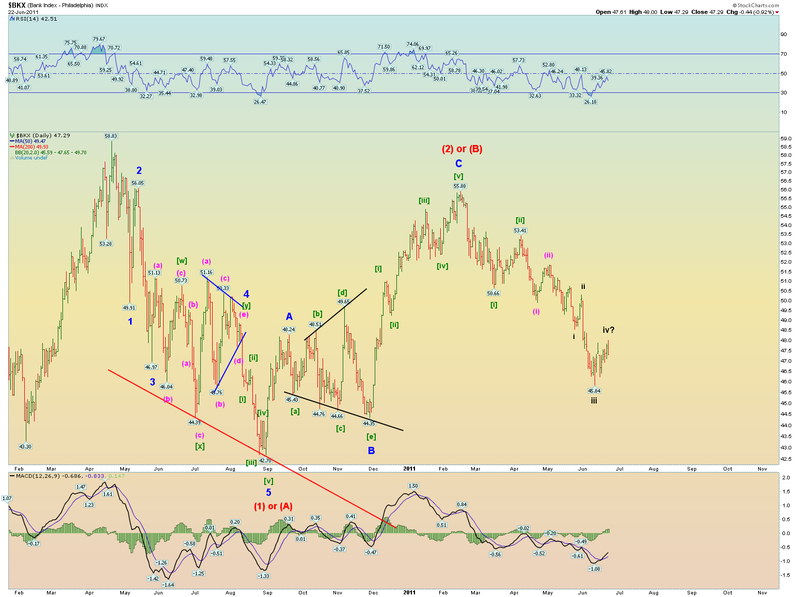 A perfect setup for a bearish reversal. 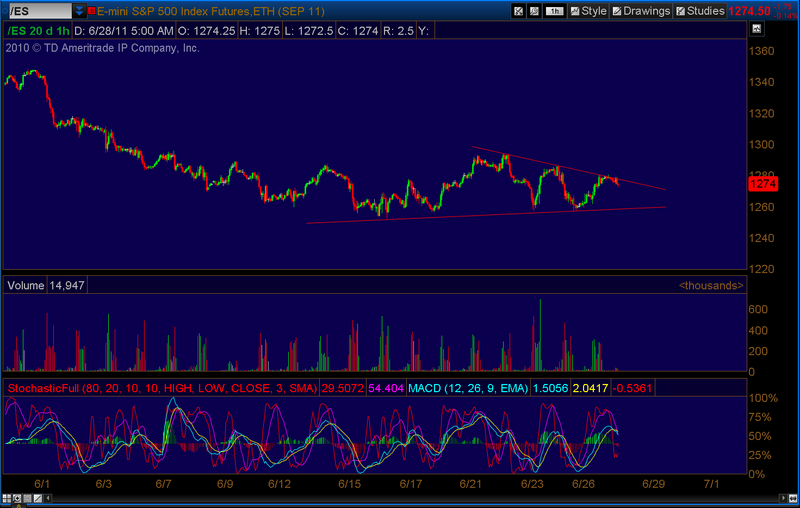 Now lets see if the market thinks so too. 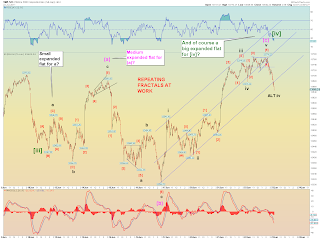 The premise is that yesterday's 90% up day was a "kickoff" day for the next significant upleg - be it a [d] wave in a triangle or Minor 5 itself (or deep wave two up if you prefer) - is predicated that yesterday's candle would not be closed under. 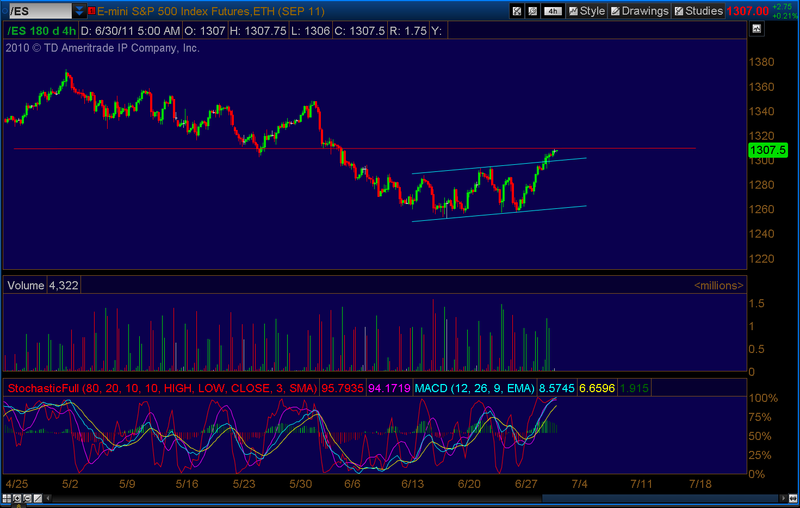 In order for bulls to accomplish this they need to consolidate and break above near-term resistance of 1295-1300. Stocks managed to hold the high ground for most of the day in very unsteady waves but the end of the day selloff is a bearish sign in my opinion. This is called the "Smart Money" (last 30 minutes of trading) and during the decline from 1370, there has been a lot of late day selloffs. This was not unlike 2007-2009 decline. In short the bulls require a follow-through up day upside over resistance before we can confirm a kickoff day of some importance. And they obviously failed today. The bears still have a formidable grip on the market and price action was very weak waves today on low volume..
By the way thats a textbook expanded flat for Minute [iv]. 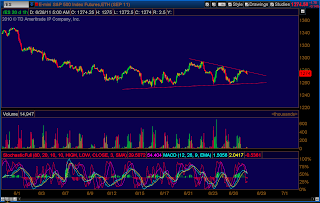 Triangle count supposes the trendline will hold. [Update 10:24PM: This next chart is going to seem to be a "duh" chart but its still important to really understand what it means. I have learned that we can come up with the most imaginative counts possible but if the counts violate what the market internals are saying, then its a low(er) probability count. For instance even though I have a possible bear count posted that supposes today's proposed kickoff day will and can be reversed in short order (as in what happened last week), intermediate term sentiment measures are definitely not on my side and are instead still in extreme bearish range. So that makes the down count a lower probability in light of today's market-bullish kickoff up candle and sentiment data. 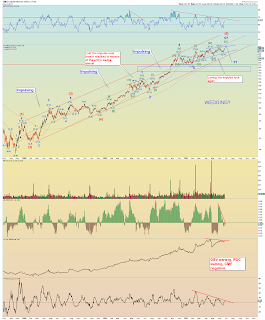 In this algo-computer run market, they take all what the data internals are telling them and price action and produce the next probable event. Can the bears win the day? Yes of course they can but they must, as a matter of price, reverse today's buying pressure and overcome it with even more selling pressure. Now the evidence suggests that buying pressure waned as we went into the 1258 low and the final spasms of hard selling pressure waned even further from Thursday to Monday. Thus today saw nothing but up for the most part. This is one reason I got bearish last week when the apparent kickoff day of last Tuesday was completely reversed by COD on Wednesday. However selling did not follow through. On the flipside we have not had a follow-through up day to today and we must see if we get one which is important. For if no one is interested in buying anymore and today was a big squeeze, we can reverse this kickoff day. So again, we are sort of at a crossroads here. For the bears to win the day, they must simply reverse today and "nullify" it as a kickoff day AND they must assume intermediate term bearish sentiment does not matter (which of course it does). 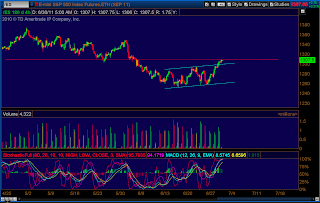 If the bulls can continue buying pressure - and produce some follow-through - then thats a bear-killer. At the moment, due to today's price action and market internals, the triangle count, as per probability, runs higher than the down count. At least in terms of an "upleg" to some higher price. And for now that might be next resistance at 1311-1312 I suppose which makes any bear count problematic which further increases the bull count probabilities. Thats EW counting in a nutshell. Its not perfect but using sentiment data, wave patterns and price action, we come up with a count that matches the highest amount of probabilities at the moment. And you have to revise every single day because ignoring a kickoff day - or at least not strongly considering it - can be painful. 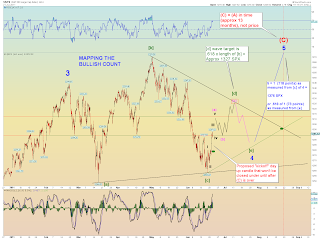 The good thing for bears is that we are back up at a point which may produce another round of bearish selling. So we'll find out how hard resistance turns out to be. 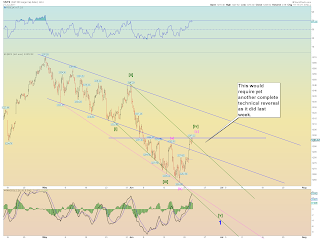 [Update 9:38PM: The NYAD count has formed an important channel line and pivot low. [Update 8:26PM: I might as well update our triangle roadmap. 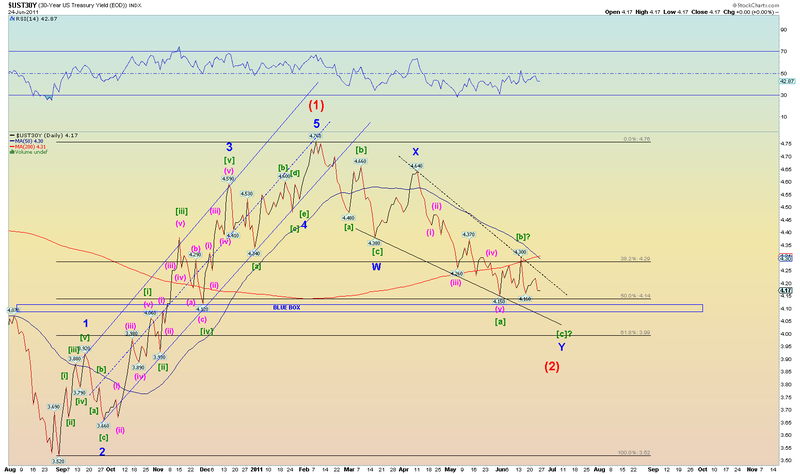 Wave [d] should be a 5-3-5 zigzag and have a target of at least 1327 SPX. I have it in wave (a) of [d] at the moment. 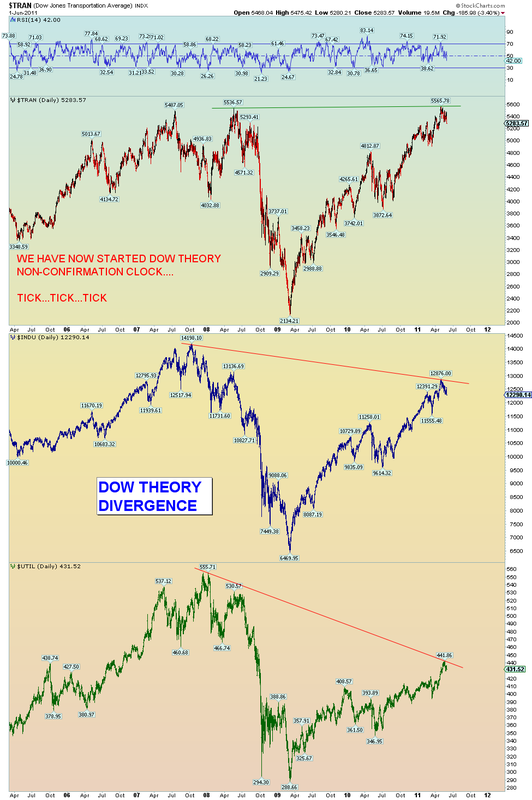 I would suspect if we challenge the highs at 1370 SPX, we would see some intra-market divergences such as a local DOW theory divergence (to match a longer non-confirmation http://1.bp.blogspot.com/-YJ01VMTmC_U/TeaplXY8PNI/AAAAAAAAJPw/lJ_IF8QpXIg/s1600/trans.png or perhaps the NASDAQ or NDX fails to confirm something along those lines. 1376 SPX comes to mind. 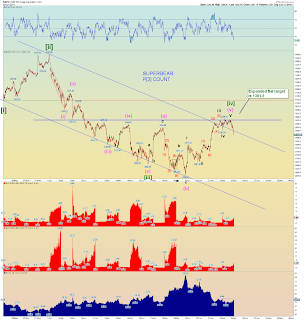 It is 118 points from the [c] wave low. This works nicely for those that consider 1258 the proper orthodox Minor 4 low that way 5 = 1 (118 points). No matter, it all works. 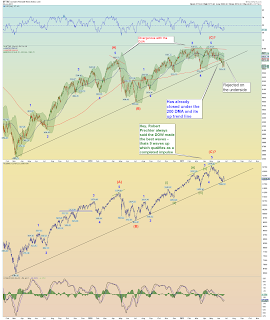 I would favor the market making a high on another 3 wave move (from 1258) just to screw with our heads again. But the triangle would explain it nicely. Obviously this projection is quite ambitious, but IF its a triangle, AND Intermediate sentiment indicators wish to work toward a bullish state again (and this is also a key), AND today was kickoff day for the final run-up(s) then today's candle shouldn't be closed under until (C) is complete. In my estimation we have had only 3 waves off the 1370 high to the 1258 low. 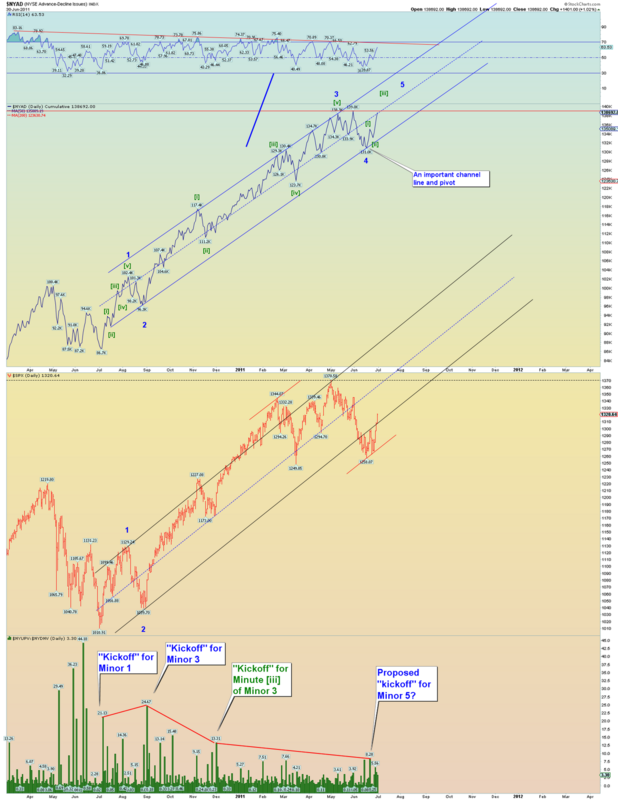 We need 5 waves down to confirm a larger trend change, or what we propose could be the start of the next major leg of the bear market sometimes known as P down. EW rules does not allow overlap between wave 1 and 4. To achieve 5 waves down, the SPX requires a lower low under 1258 prior to any price breach of 1311 SPX. 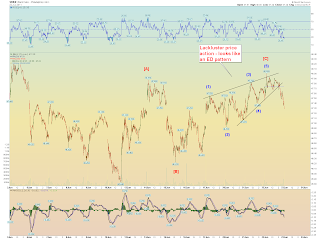 Tuesday of last week, the market had an apparent kickoff day on solid internals for what I propose was a [d] wave up of a large Minor 4 triangle. The next day that kickoff day was reversed and closed under. 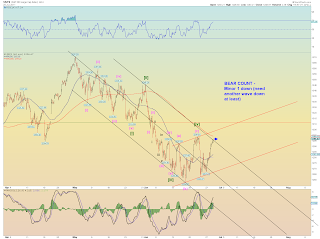 That was bearish technically but it has turned out to be only temporary. 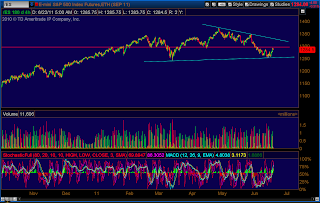 Selling pressure eased as the 200DMA was hit. 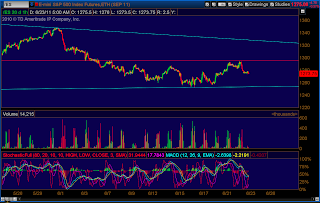 The 1250 pivot was not challenged. Buyers came in. 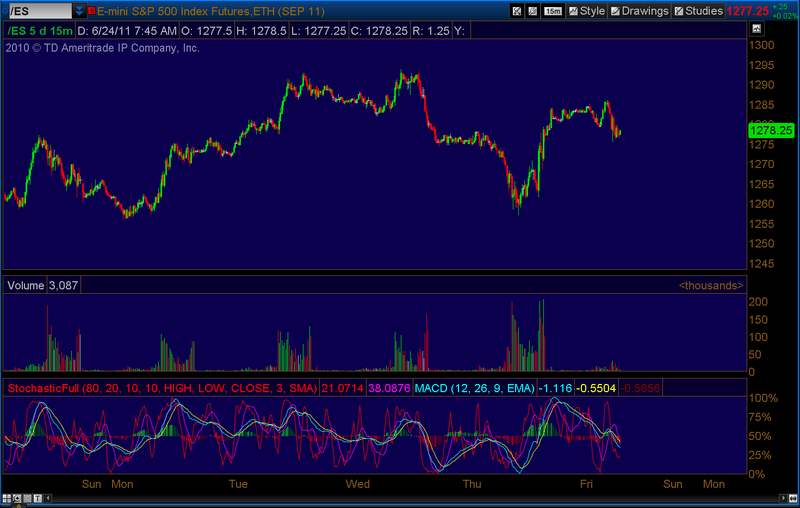 Now today another apparent "kickoff" day up candle has been painted with just as strong market internals as last week. It makes sense that if there was to be a [d] wave kickoff day this would again be it. The premise of a kickoff day of a [d] wave is simple: This candle will not be traded under until Intermediate (C) wave is over and headed down. 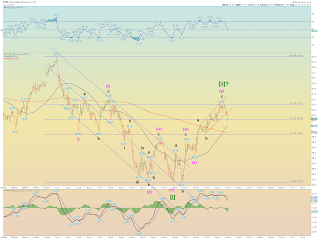 I show the Wilshire for form but the Fibonacci [d] wave target for the SPX would be .618 x [b] = 1327 SPX or so. The first step required for the bears is to reverse this bullish market internal day and close the tape under today's candle If that is accomplished that opens the door to further selling. What are the odds of that happening? Well it happened last week didn't it? So it can be done. 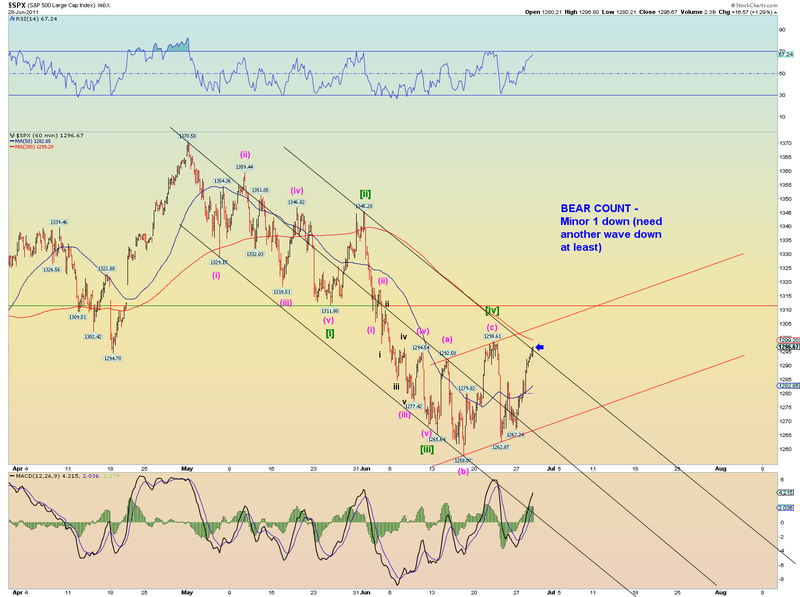 The bears need a downside surprise and fast. We await Greece's vote. The Wilshire still has its virgin space intact. And Minor 1 overall. Again, I only have this as 3 waves off the top. As I have been harping, most Intermediate-type (those that track weeks/month time frames) sentiment data is extremely bearish. That is why I suggested the bears have a small window of opportunity to force some real panic selling to much lower prices before Minor 1 bottoms and the Intermediate indicators get squashed. If the market requires a significant relief of excess longer-term bearishness, it will take a lot more price and time to do so. 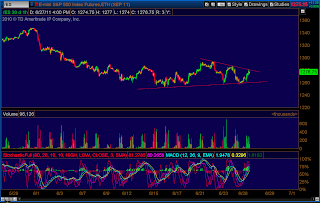 That is why the Minor 4 triangle is favored in that effort if thats whats happening. 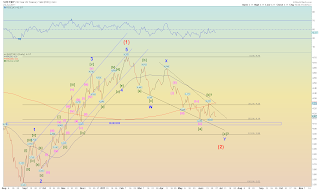 Again, in my estimation, and according to the rules and guidelines of wave theory, the bears need an outright reversal of today, and quick, in order to maintain control of the Intermediate term trend. 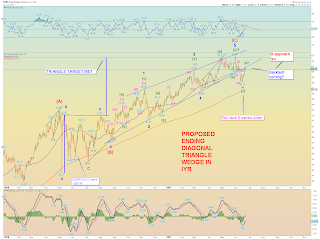 Otherwise the market will begin to correct Intermediate term sentiment indicators and thus the triangle count, and a challenge to 1370 highs is not out of the question.